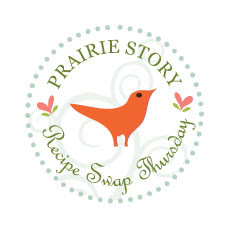 Thank you for coming to Prairie Story Recipe Swap Thursday! There have been so many mouth watering, taste bud tingling, and scrumptious recipes shared in previous weeks. I love seeing all the recipes and visiting your blogs! Recipe Swap Thursday's most popular recipe last week was Grandma's Mud Cake from Kori @ [Refresh]. If you haven't already, be sure to check out this recipe! To kick things off this week I've posted a new recipe - French Onion Soup. As the season change to Fall, I seem to make good pot of soup most weeks. 1) Link directly to your recipe. Scroll down and click on the "Add your Link" button. You will be prompted to enter the URL (link directly to your post), Name of your recipe, and Email (not visible), and then select a Thumbnail to upload. A big thank you to all recipe swappers, blog hoppers, my loyal readers, Twitter and Facebook followers, fellow foodies, family and friends for your support. I'm so happy to be able to share my Prairie Story, and appreciate that you take a precious moment or two out of your busy day to visit my blog! Good morning Alison! I love french onion soup and it's been so long since I've had it. It looks delicious! Thank you for hosting and have a great day! French onion soup sounds yummy. Have a nice day! Hello Alison, French onion soup looks healthy and delicious. Have linked up my entry for this week event. Thanks for hosting..
Good morning, Alison! Thanks so much for linking to my blog! I think this recipe swap is such a great idea, and I look forward to sharing each week. Have a great day! What a delicious recipe -- my husband would love it! I tell ya, the best recipes end up on your linky. Going to go check them all out! Your onion soup recipe looks and sounds delicious. Thank you for reminding me how comforting and delicious a bowl of onion soup can be - and thank you for hosting! Mmmm... Onion soup is one of my favorites. Your recipe looks fabulous. I contributed my blackberry peach cobbler. Enjoy! I haven't had onion soup in forever! Looks great! Thanks for hosting!! There are so many wonderful recipes here, I could move in. Sorry I put my name instead of the name of my dish!!! New to the whole 'link' thing. What a blonde moment. Recipe #25 is BBQ Brown Sugar Salmon! Enjoy! I haven't had French Onion soup in ages. Your recipe sounds delicious. I don't know why but I have never made it. I think this is the inspiration I needed to do so. Thanks for hosting. I love French Onion soup. I think I am going to the pantry for some onions right now. Such a great fall dinner idea and I'm ready for fall dinners just about now. Lovely blog you have here! 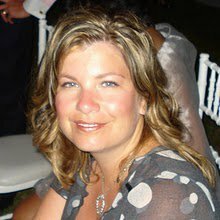 I have been looking for a friendly homestyle cooking blog to share with, so glad I found you, Thanks so much for hosting. Your French Onion soup sounds delicous. Thanks for hosting and letting me join such a great party!! Your onion soup looks tasty! 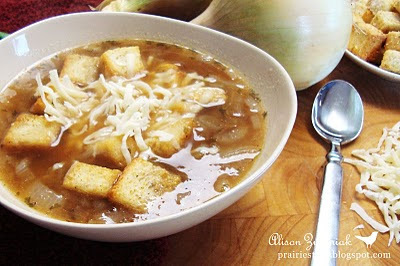 I adore French Onion soup; it's starting to feel a lot like fall to enjoy some too. Thanks for hosting the party; please stop by mine that has just started up with anything fresh, clean, or pure in your life, recipes, etc. I welcome your participation! I am already one of your followers and enjoy your style very much! Darn it... I missed the swap again. I can't keep up these days. Everything looks yummy! I added my roasted root vegetable recipe, which was inspired by a comment you left on my blog. Onion soup is my all time favorite! Yours looks wonderful! For some reason, it won;t allow me to add my image... weird. But this is a brilliant idea. Can you send me the plug in you use to do it with? Onion Soup is definitely a favourite of ours, and we spent a lot of time tasting many in Paris this summer. YUM! Wow! 43 participated in the swap. Thanks for hosting. Caramel upside down cake looks delicious! French Onion is my favorite soup! This looks delicious.